On a warm spring day in the state of Chiapas, villagers in the small hamlet of Jose Maria de Morelos walk uphill on the town's only paved road to reach a small complex of school buildings. But today is not a school day; today, the river blindness elimination brigade is meeting at the school. Inside, a Chiapas state health brigade worker measures the height of a squirmy boy about eight years old. The brigade worker then checks the boy's head and shoulders for signs of nodules. These small, hard telltale bumps under the skin indicate the parasite that causes river blindness, also known as onchocerciasis, has infected its host. The boy has none. The brigade worker asks the boy if he's ever had any nodules, and the boy shakes his head, "No." The answer is common for his age. Less than a generation ago, the answer almost surely would have been in the affirmative. 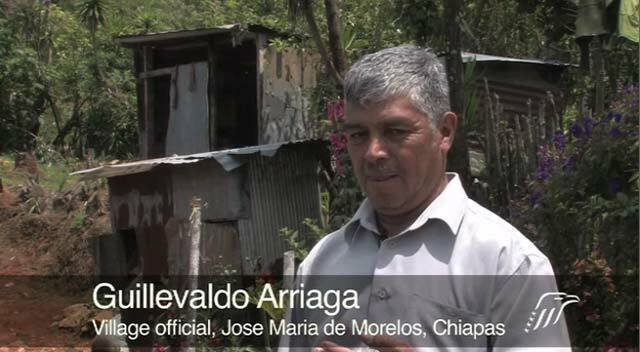 "There really has been change," says Guillevaldo Arriaga, a local village official and father of four. "The young people used to be sick." River blindness once was so prevalent that brigade workers would reach remote villages to find residents with dozens of nodules all over their bodies. The source of onchocerciasis is a small black fly that inhabits riverbanks in the region and transmits the disease to humans with its bites. The bites themselves cause terrible itching and skin problems, while the infection, if left unchecked, can lead to blindness. Those days now seem distant thanks to the efforts of the state's health brigades, the Onchocerciasis Elimination Program for the Americas, The Carter Center, and the Mexican national river blindness program. But in addition, success has come in large part from the communities themselves. For decades, local leaders have worked with brigades to increase participation in the treatment: a few small pills of Mectizan, an antiparasitic drug, taken every three or four months. The drug is donated to the program by Merck. These efforts are poised to pay a dramatic dividend. Mexican health officials will stop distributing drug treatments in 2012. The program will then do three years of intense surveillance, making sure the disease doesn't return and keeping Mexico on track to eliminate river blindness completely by 2015. Interrupting and ultimately eliminating the transmission of river blindness has required that a large majority of an area's population take Mectizan regularly. For organizers, reaching this goal means ensuring that a brigade's visit is always an important day for every family in the village. Three generations of women are making their visit to the school today. The oldest is Irene Hernandez, a grandmother of 10 who lost her sight decades ago, likely because of the disease. She is accompanied by her daughter Lidia, and one of her granddaughters. A brigade worker checks his lists and reminds Lidia they have yet to see family members. "We still need to see Abram and Daniel," he says. "I'll send my four kids over in the afternoon," Lidia responds after gulping a glass of water to wash down the Mectizan pills. Lidia says she never thought twice before taking the pills, because her mother has told her since she was a little girl how important they are. "Sometimes I sit down and tell my grandchildren how I lost my sight because I didn't take the pills back in those times," Irene later explains. Telling children how river blindness used to affect the community is one of the tactics adults here use to ensure that everyone understands the importance of their collective effort. "These days I look around and see the young people, and the kids who are 10 or 15 years old; they don't even know what the disease is," Arriaga says. "They take the pills, but they don't have any experience of what it was. That's the kind of advance we've had. And the community is more united now."